An IT industry analyst article published by SearchDataBackup. 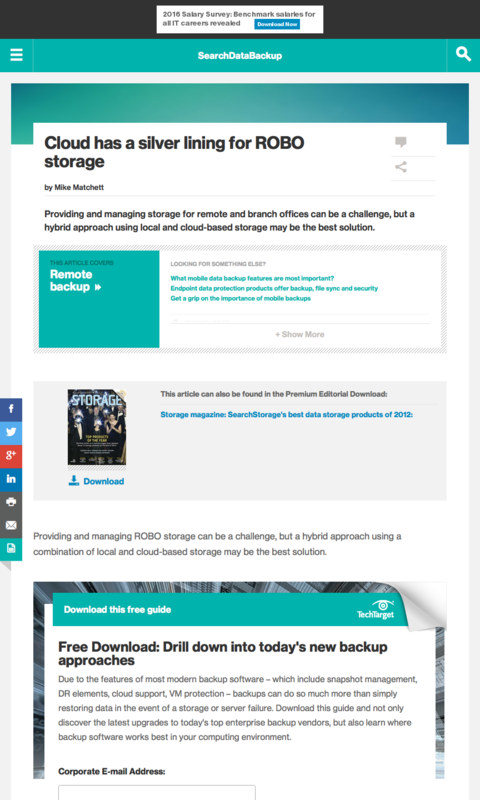 Storage managers know that providing great data storage services to remote or branch offices (ROBOs) isn’t simply a matter of replicating a single, small office solution or extending data center storage to each ROBO with a WAN. But some vendors still insist that their traditional storage and data protection products can easily extend to cover ROBO needs, perhaps with just a few add-ons, a third-party product or two, and a bit of custom scripting. What they don’t mention is how quickly costs can climb, how tough management can be, and what to do with users who aren’t happy about compromising performance, accessibility or protection. But there is hope. I’ve seen a couple of key trends that bode well for ROBO storage. First, cloud-based and cloud-enabled services are providing new opportunities to rethink and redesign storage services for distributed and mobile use cases. ROBOs are by definition distributed, and their users tend to be highly mobile. Second, some vendors are taking advantage of cloud services to build specific products to address ROBO storage challenges. This entry was posted in Published Articles and tagged Cloud Storage, ROBO, SearchDataBackup, Taneja Group by Mike. Bookmark the permalink.